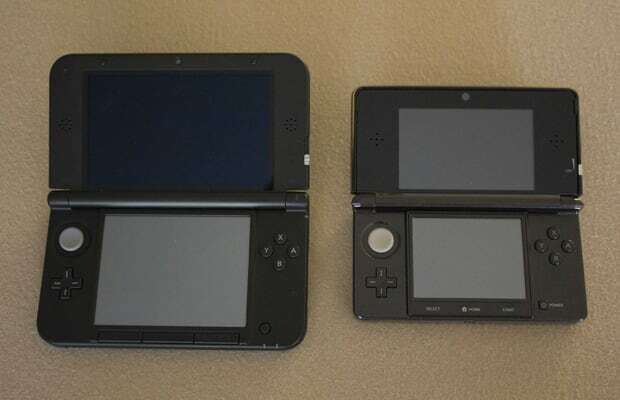 So the 3DS is prettier, and it's more comfortable for any gamers with normal-sized hands. But what about the massively embiggened screens? They're 90 percent bigger than the 3DS's, and there's been concern that practically doubling the display size without upping the resolution would cause games to become pixellated and unattractive. On the contrary, every game I tried looked much better on the XL's inflated screens. There's no more pixelation than exists on the original 3DS, and visually cluttered titles like Cave Story 3D and Resident Evil: Revelations are actually given room to breathe, making their convoluted worlds more immersive and easy to navigate. And somehow, virtual console Game Boy Advance titles like Metroid Fusion even look better. The system's 3D effect seems marginally improved as well. Playing Mario Kart 7 on the larger display makes the 3D less finicky, though Cave Story's still made my eyes itch on occasion. And Theatrhythm: Final Fantasy's tip-tapping rhythm gameplay is made that much more manageable on the also-enlarged lower touchscreen. Plus the screens' new matte, anti-glare finish is immediately noticeable and a huge improvement.